A Greenpeace report released Wednesday gives kudos to tech giants such as Facebook and Apple for using an increasing amount of renewable electricity to power their data centers. The research shows that Google, which sells its data center services to businesses, has been the most ambitious by buying wind energy that is then injected into the local electric grids where it runs data centers. Microsoft started to do the same last year when it agreed to buy power from a wind farm in Texas. Amazon and Oracle, on the other hand, earned poor grades from Greenpeace for not showing a willingness to use clean energy for their data centers. For companies that can’t afford to build their own data centers, there are growing options to choose data center service providers that count clean power as part of their marketing efforts, according Greenpeace. In the report, Clicking clean: how companies are creating the green internet, Greenpeace creates a “clean energy index” based on data from companies or otherwise publicly available information. The index reflects how much clean energy, on average, a company uses to power its data centers. While the Greenpeace report highlights several American companies that have committed to using renewable energy such as wind and solar, European data centers that already run on 100% clean power are working hard to woo customers with its eco-friendly credibility. Iceland-based GreenQloud, for one, is setting up its first data center in the US near Seattle. It picked that location for the ability of its local utility, Seattle City Light, to deliver roughly 95% of its electricity from renewable sources, most of which comes from hydropower, said Jon Thorgrimur Stefansson, CEO at GreenQloud. The company, founded in 2010, plans to start running its US data center before the end of May. Back at home, hydropower and geothermal energy run GreenQloud’s two data centers. The firm manages servers and hosts websites and other operations for companies that don’t want the trouble of managing their own computers and data storage. This type of service is called cloud computing, which has gained popularity because it removes the need for a business to put up the big money to buy servers and software and manage them internally. The growth of cloud computing, which means the number of data centers will climb, also means its service providers could face increasing pressure from customers to reduce their carbon footprint and use less dirty power. That’s certainly the case in Europe, which is setting out to cut 20% of its energy use – compared to the 2005 levels – by 2020. European Union policy makers are fretting over whether they can reach that goal, given the growing use of data centers to run an increasingly digitized world. GreenQloud isn’t alone in touting its green power credibility. A number of other European data center service providers tout their use of renewable electricity, such as Green Mountain Data Centre and Fjord IT, both in Norway. Iceland and Norway are two popular places for building data centers. Hydropower is a primary source of electricity there, and the Nordic climate provides some natural means for cooling the servers. The US lacks the policy mandate that makes renewable energy use and emission reductions priorities for the information technology service providers and their customers. “In the US, it’s more about social pressure or pressure from environmental organizations such as Greenpeace that is pushing companies to use sustainable energy,” Stefansson said. GreenQloud has about 2,000 customers from the US, many of which are universities, companies in the healthcare field and individuals, he added. 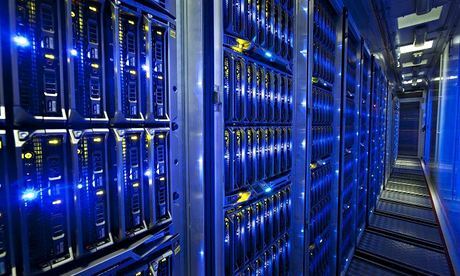 The US uses the most power to run data centers, followed by Japan, the UK and Germany, according to the Greenpeace report. Stefansson noted that less than 20% of the electricity used by most of the cloud computing service providers globally come from renewable sources. Aside from Greenpeace, efforts by Google and other tech companies to buy more renewable electricity also have forced their peers to consider doing the same. Texas-based Rackspace, for example, is looking for opportunities to buy clean power for any of its nine data centers worldwide, said Melissa Gray, Rackspace’s senior director of sustainability. Until now, Rackspace has been reducing its carbon footprint by buying credits that are connected to each renewable energy project and sold to generate an additional revenue for its owner. The method is popular and takes less time and money than signing power purchase agreements, which require contract negotiations with power producers and a long-term commitment – around 20 years in some cases – to pay for the electricity. Greenpeace is pushing tech companies to buy green power rather than credits and to do so in regions where they run their data centers. The idea is to replace power from coal or natural gas power plants with cleaner energy at the local electric grids. Usually, a company that buys wind or solar energy doesn’t receive the electricity directly from the power plant, which could be miles away and is set up to pipe electricity into the grid. While using green power may appeal to Rackspace’s customers, it’s not a deal breaker. Ucilia Wang is a California-based freelance journalist who writes about technology and the environment. Previously, she was the associate editor at Greentech Media and a staff writer covering the semiconductor industry at Red Herring.